When using the IOS CLI, you will want to refer to names instead of IP addresses. Particularly for the trace, ping, and telnet commands, the IP address or host name must be supplied. This section describes the use of host names on an IOS-based device. Along the way, some nuances of the use of Telnet are covered. IOS can use statically configured names as well as refer to one or more DNSs. Example 13-9 shows some names statically configured, with configuration pointing to two different DNSs. name - server 10.1.1.200 10.2. Router Cooperstown will use any of the three statically configured host name-to-IP address mappings. Three names are configured statically in this case—Mays, Aaron, and Mantle. Any command referring to Mays, Aaron, or Mantle will resolve into the IP addresses shown in the ip host command. Router Cooperstown also will ask a DNS for name resolution if it does not know the name and IP address already. The DNS configuration is shown toward the end of the configuration. The IP addresses of the name servers are shown in the ip name-server command. Up to six DNSs can be listed; they are searched for each request sequentially, based on the order in the command. Finally, the ip domain-lookup command enables IOS to ask a name server. IP domain lookup is the default; no ip domain-lookup disables the DNS client function. For names that do not include the full domain name, the ip domain-name command defines the domain name that should be assumed by the router. The show ip host command lists the static entries, in addition to any entries learned from a DNS request. Only the three static entries were in the table, in this case. The term perm in the output implies that the entry is static. Also note that when short names are used—in other words, the name does not include the DNS domain name—the router adds the domain name of gileadfoundation.org, as configured in the ip domain-name gileadfoundation.org command. 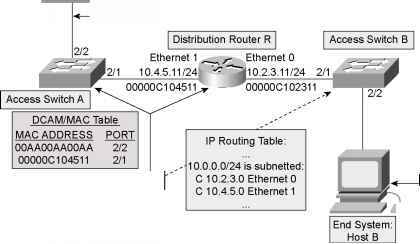 Configure the ip domain-lookup global configuration command. Configure the ip name-server svr1 svr2... global configuration command. Use the ip host name address command. Use the show hosts exec command.